A new chapter in the NASCAR history books has been opened. The inaugural Whelen Southern Modified Tour is now in full-swing and the optimism surrounding the series is as big as the hype. Race number-one is already in the book. 21-modifieds took the green Saturday night at Caraway Speedway in North Carolina, the field filled with the "King of the Southern Modifieds," former SMART champions, past winners, future superstars and some Northern invaders. The Northern boys looked good in the 150-lap race. One led early, another marched forward from the rear of the field and yet another, namely Ted Christopher, won the battle in the Southern territory. TC did not only win, he dominated the event. Christopher always likes to stir the pot a little bit; that’s what makes him so charismatic, but the bottom line is, he did crush the competition. There has always been a discrepancy between the Northern and Southern Modified divisions; not in terms of competition, but in the amount of money spent. The Northern teams have traditionally had better engines and better equipment and although the winds of change are sweeping through the Modified world and that gap is closing, it will take a while to do so. 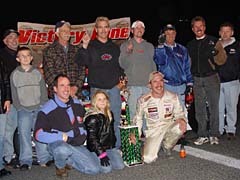 The story though, is that TC won the first-ever NASCAR Southern Modified Tour event and that puts another notch in the belt of his already accomplished career. He’s also happy for a couple of other reasons. First, his brother Mike will now take over that ride on the Northern Modified Tour this year, and secondly, he was able to help that team out in a time of need. Roger Hill (team owner) and their driver for the past several years, Eddie Flemke Jr, parted ways this week. Yet, it was ironic to see Christopher wheel the same mount he is at war with every race on the Northern Whelen Mod Tour. Christopher’s main competition in the race might have come from Jay Hedgecock. The Southern competitor led early and actually handed the lead to Christopher when the 41 went up in smoke with engine problems. But it wasn’t all easy for Christopher, who battled up through the field from his 12th-place starting spot. “This is the first time I ever drove one of their cars so I didn’t know how it was going to act,” said TC, who drives the Mystique #13 on the Northern Tour. “If you drive your own car you know how many laps it is going to be good for and you can alter your driving style to it, but I had no idea going into this race and was probably a little more conservative because of it. 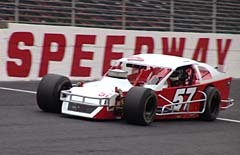 Jamie Tomaino, the ’89 Northern Modified Tour champ, finished third and another Northerner, J.R. Bertuccio, led early on before his engine expired. But second-place finisher Jay Foley was quick to point out it was by no means a Northern romp. Hill, a former Mod racer himself, never won a race at Caraway, a track nestled in the hills near Asheboro, NC and he was pretty proud of the fact that his car wound up in victory lane. As far as TC goes, he just loves being a racer. Look out if he does, because everyone will be gunning for him. And look out racing world too, because the NASCAR Whelen Southern Modified Tour is ready take you by storm. 1. 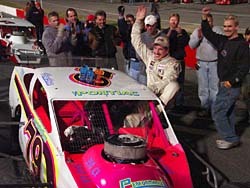 Ted Christopher, Plainville Conn.
3. Jamie Tomaino, Howell N.J.
4. Junior Miller, Pine Hall N.C.
5. Frank Fleming, Mount Airy N.C.
6. Alex Hoag, Bath N.Y.
7. John Smith, Mount Airy N.C.
9. Michael Clifton, Walkertown N.C.
11. Gene Pack, Walkertown N.C.
15. J.R. Bertuccio, Centerreach N.Y.
16. Kevin Eckerich, Clayton N.C.
17. Jay Hedgecock, High Point N.C.
18. Corey Smith, Thomasville N.C.
19. Brian Pack, Walkertown N.C.
20. Jason Myers, Walnut Cove N.C.